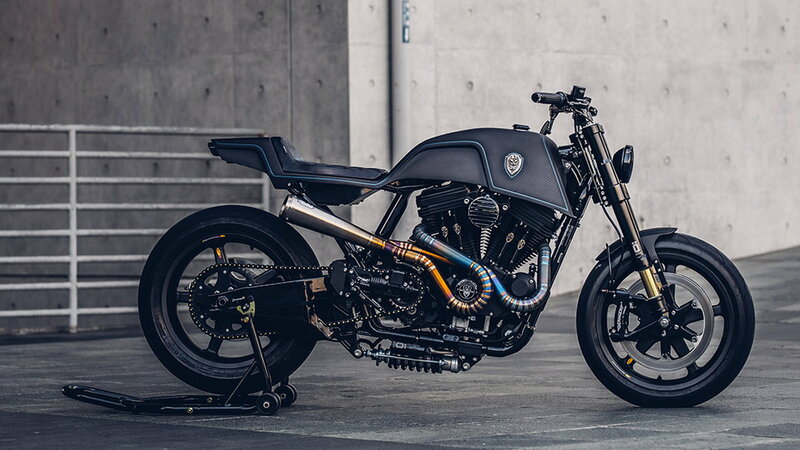 Daily Slideshow: When Rough Crafts get their hands on a Sportster, the results are nothing short of awesome. And the 'Raging Dagger' is no different. In building a custom Sportster, it's hard to go wrong with a Forty-Eight. Rough Crafts bike builder, Winston Yeh, knows this all too well having designed and built several custom Forty-Eights over the years. This particular model has overgone a major overhaul, shedding almost 90 pounds and gaining a more aggressive stance. It's certainly one of the sportiest looking Forty-Eights on the road today. 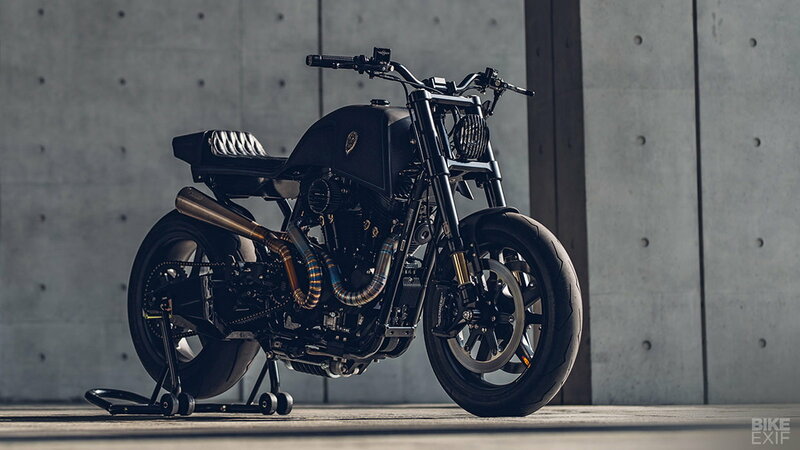 This bike goes by the name 'Raging Dagger' which suits its aggressive stance perfectly. The request for the motorcycle came from a somewhat unusual place. Yeh received a phone call from a salesperson at Harley-Davidson Taiwan: a customer had requested to meet the bike builder. 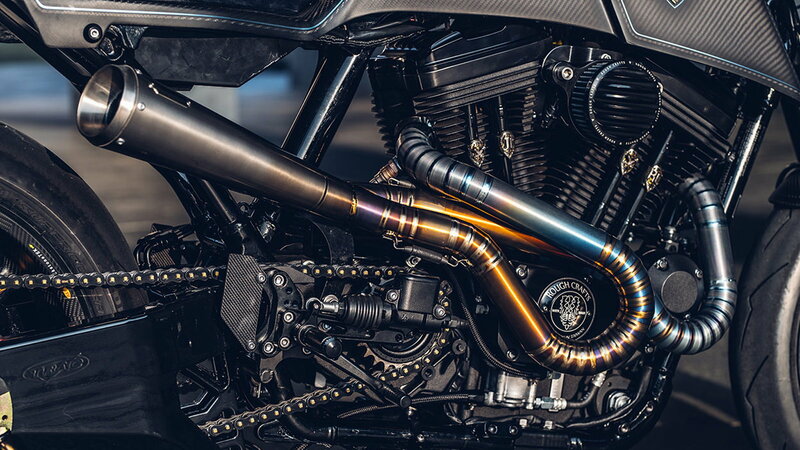 Yeh explained, "So I went over and found out that the customer had already ordered a brand new Forty-Eight, and was waiting for me... All he told me was: 'I like the look and feel of American V-twin engines, but I want something over the top.'. Well, this bike certainly fits that description. >>Join in on the conversation about this custom Sportster right here in HDForums.com. One of the customer's specific requests was that the bike be easy to ride. Since Rough Crafts don't usually make major modifications to the frame or engine, Yeh focused on changing the suspension, brakes, and weight. 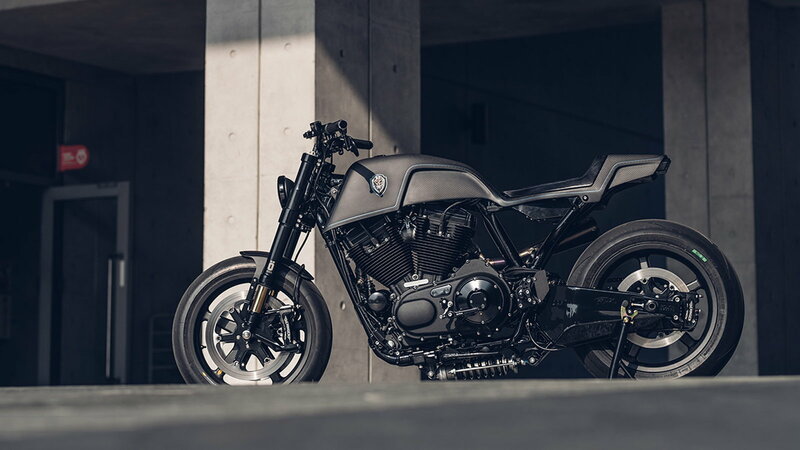 When looking for inspiration, Yeh didn't need to venture too far from home saying, "My biggest inspiration came from Buell motorcycles, which have close proportions to the Sportster - but with race bike influences." 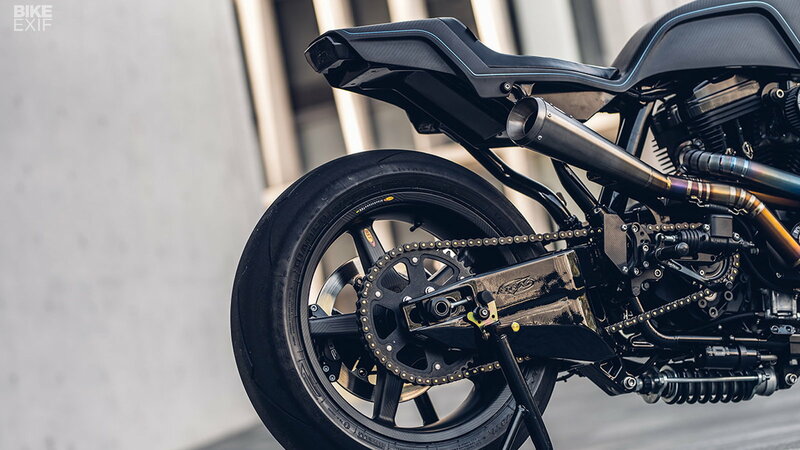 While looking to Buell for inspiration Yeh came across the Öhlins AG629 rear shock which is usually found on the Buell L1/X1 Lightning. The hard part was fitting it to the lightweight Trac Dynamic swingarm. Yeh explained, "I asked Trac Dynamic not to weld the normal lower mounts for two shocks. Then we carefully measured, 3d designed, laser cut and welded on an oil tank.". After this, he designed his own triple tree and fitted it to Öhlins FGRT206 forks which were made for a Yamaha R1. Apart from being beautiful, the BST carbon fiber wheels on this bike shave a lot of weight off. At the front, you'll find twin Beringer 330mm outers and floaters. Yeh designed his own six-spoke carrier to match the BST wheels. 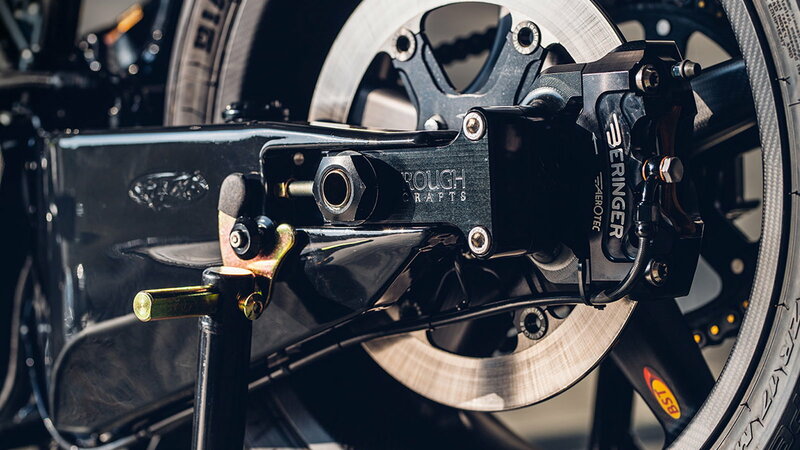 The rear caliper mount is connected to the chain adjuster and looks incredible, however it was born out of a mistake. Yeh said, "The rear caliper mount was a beautiful mistake, I forgot to weld on an anchor point for the caliper mount, and didn't realize that until after it was powder coated.". This error forced him to think outside of the box, and the results speak for themselves. This Forty-Eight feels more like a sportbike since the rake has gone from 30 degrees down to 24 degrees, making it one lively machine. Amazingly Yeh didn't cut or weld the frame to achieve this, it's the result of the rear end now sitting higher. What really makes this bike nimble is its weight or lack thereof. This biggest weight saver is the titanium exhaust built by MS Pro. The high-riding system might make some people anxious but Yeh explains it's not a problem, "As scary as the rear pipe looks, it's actually well clear of your leg.". This pipe undoubtedly sounds as good as it looks.